At the beginning of this year, on a Friday evening Armin and I were standing in front of the indoor climbing wall after it had closed. Both of us had nothing to do and so we started a conversation, which soon dealt with the ruins of the old, fucked up refinery. We had been talking about them many times before, but had just talked and never set out to have a closer look. So we spontaneously decided to put on warm clothes and drive there. What we knew was that the refinery was about to be pulled down that year and there wasn't much time left to have fun there. On Friday night at half past twelve with a cold wind blowing at zero degrees centigrade, which felt like minus ten degrees, we climbed over the site fence of the industrial area. After we had inspected some of the huge tanks and had worked our way slowly into the interior of the area, we were standing in front of one of the 120-meter-high red and white chimneys we had come for. I climbed the first pitch on the aluminum ladder attached to the chimneys, Armin climbed the second one. 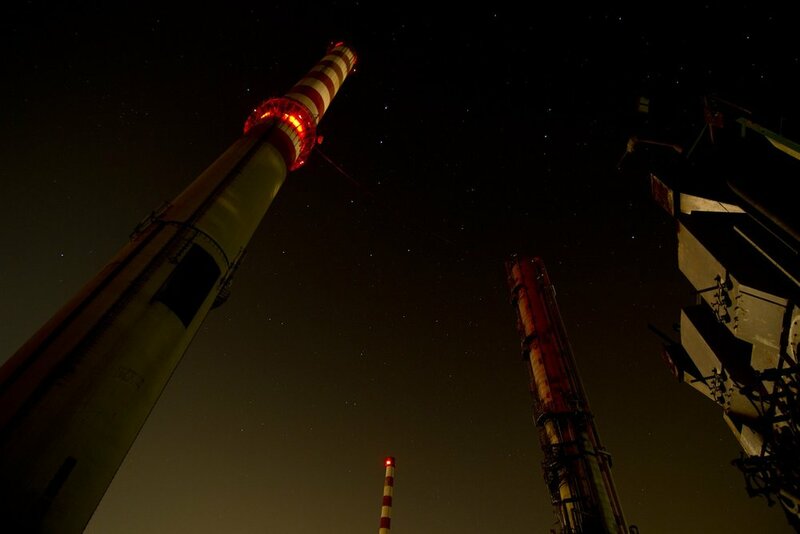 We reached a platform at a height of 70 meters that ran around the chimney with railings. The view was rather cool inspite of the darkness. It was even cooler to realize that there was a steal silo of the same height right opposite of us. The idea of a monstrous, industrial highline manifested itself in our minds! Dirty, cold and tired but absolutely enthusiastic and motivated by our action during the night, we were sitting in the nearest fast food place at half past four in the morning eating fatty stuff. For the time being there was only this first inspection of our playground and another one during the day about a week later together with Klaus and Sonja. We realized then how many opportunities this site offered for highlining. It was only two months later, at one of the first warm weekends of that year, that we remembered the old ideas. I was seeing Johannes, Alex and Clemens for slacklining and told them about what we had found out, which they liked at once. We went back to my house the same evening to rig two highlines the next day. We – Johannes, Alex, Armin and me - met at a car park next to the area on Sunday morning carrying loads of material. After there were no more cars to be seen, we climbed over the fence. As the whole industrial area had been closed down long before, we thought to be invisible as soon as we were on the site. Our destination: two highlines between two oil tanks. Having reached the two tanks, we saw that the tanks had already been dismantled in parts, which meant that one of the tanks was useless. So we decided to rig the lines across the opening of the other tank. In retrospect this was by far the nicer version. The set up was easy – a ladder at the outside, a grid runway around the tank with railings and massive fixing points everywhere. So the highlines were rigged quite quickly. Meanwhile Klaus, Sonja and Clemens had joined us, the team was complete and the lines wanted to be walked. The atmosphere was fascinating; there were pictures of a dockyard in my mind, huge, rusty steal walls, thickly varnished grid runways and railings. Everything around us was simply huge and dismantled in parts. There were cut up steal plates and piles of rubble. 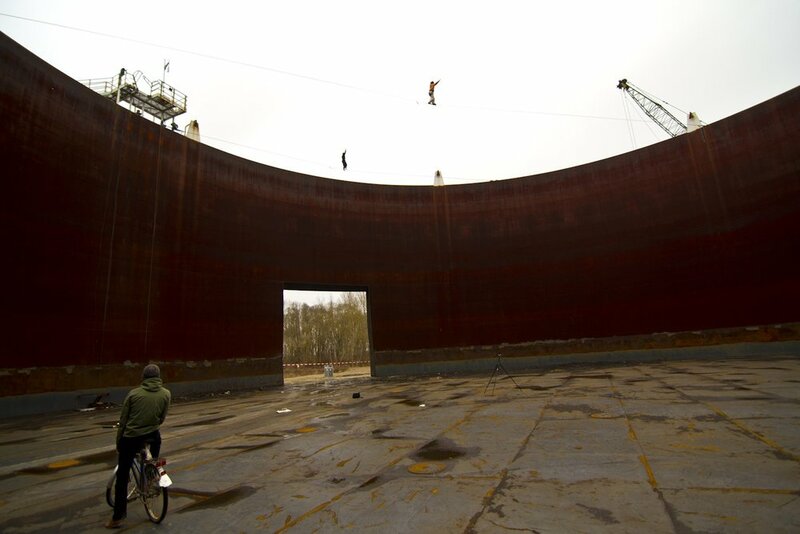 All sounds echoed strangely in the 20-meter-high steal cylinder 60 meters in diameter. The sky above us showed grey clouds. Like that we spent all afternoon in that surreal environment, far away from both civilization and nature. So we were able to keep on highlining, although we were a little apprehensive if the car would come back or not. Finally we had had a very different day of highlining and the same evening we sat down to plan more urban highlines in that industrial area as long as the tanks were still there. So the following two weekends were planned. Hannes came to my house exactly a week later on Saturday evening. On Sunday morning we drove to our playground again and met up with Armin and Felix there. This time we were very careful from the very beginning, as we knew that the area wasn't as deserted as it seemed. We had brought binoculars and were watchful. 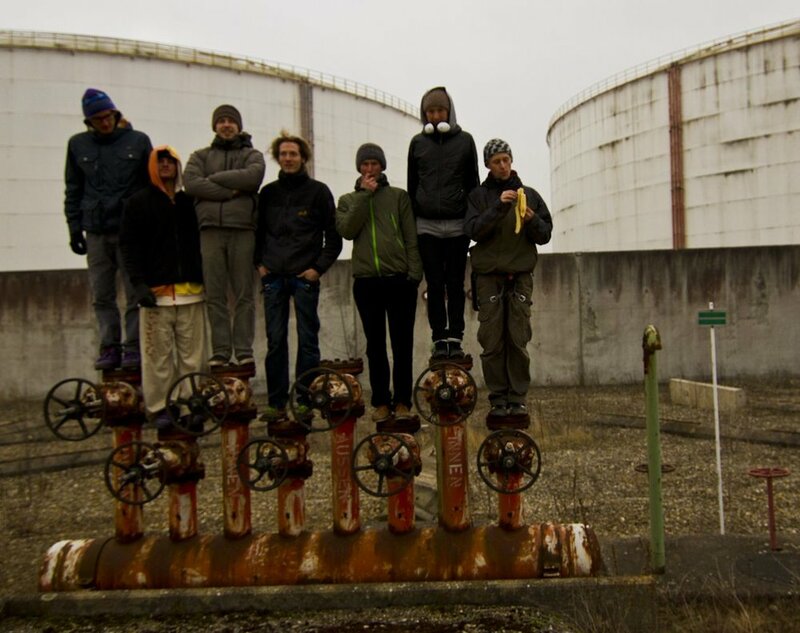 Felix, Armin and me explored the whole area first, while Hannes examined two fat tanks. In the back part of the tank there was steam coming out of some pipes and there was a strong smell of gas. There we discovered the car that had surprised us before parked in front of a container. We hid behind a small wall and waited. Soon some guy came out of the container, got into the car and drove off. So we decided to get started. Our spot was a line between the two big tanks. Again it would have been easy to use the ladder running up the outside of the tanks. However, we hesitated to use it, as we would have been visible to a crowd of football players including the spectators. There was a football field only 500 meters next to the industrial area. The spot itself couldn't be seen from it. So Hannes decided to climb up along the pipes on the outside of one of the tanks, while I sneaked up the ladder of the other tank hoping the football match was more interesting than the old oil tanks. Having reached the invisible part, we fixed both anchor points, which was easy because of all the massive steal parts up there. The atmosphere was similar to the week before. The sky was covered in grey and this time there was a cold wind in addition. We spent all afternoon on the huge roof, the tin of which was unstable at some parts making frightening noises. As I was cold, I spent as much time as possible on the line. Hannes walked after me and Armin had some good tries, too. Later Clemens came and struggled hard to get across to the other side of the line. The hostile environment made it difficult to concentrate on walking. Towards the end of the afternoon there was this moment of fright again. I saw the same van as a week before driving slowly towards our spot. The command “Lie down flat” interrupted our relaxed afternoon drinking tea, talking and preparing for our next walk. The whole group was on the roof of one of the tanks. We ought to be invisible lying down, I thought, but at the same time I was convinced that we had already been spotted. The driver of the van was heading straight towards us. Luckily he crawled past us, circled the area without ever looking up! We remained undiscovered that day, derigged the lines and left the area quickly. We realized that the area was checked at about the same time every day. Unfortunately, we didn't know the full schedule and so we had to make better preparations for our next action. We knew that we wanted to come back at least one more time to have a dignified ending of our highline invasion of this industrial area. We had one week to prepare everything. This last project would be more than invade, walk and leave quickly. We knew it would be hard, but we also knew it would be something unique and great, full of adrenaline: “The highline!” It had been burnt into our minds from the very beginning. During the following week our team took a definite form: Johannes, Alex, Anatolij, Armin, Clemens and me. If we wanted to succeed, everything would have to be planned well. So we tried to find out the schedule of security surveillance. A friend of ours managed to get the boss of the security on the phone and was told that there was no permanent security on the site. We had assumed that anyhow and didn't get any further information on the random security checks. OK, so the action had to take place again “blind”. The whole team met at my house on Friday evening. We planned the project carefully, sorted materials and assigned tasks. We set out at midnight agreeing on working only at night as inconspicuously as possible. The plan for the first night was to climb both sides, attach fixed ropes at the chimneys, finish building the anchor points on both sides and transport all the gear up to the anchor points. Hannes and me climbed the ladder on the outside of the chimney, Alex and Armin the stairs and ladders of the steal silo. It turned out to be extremely strenuous to climb 70 meters with fully packed backpacks, even if it was only a vertical ladder. An additional weight was the static rope we pulled up behind us. Hannes led the first 25 meters of the climb, me the rest to the grid platform, where the anchor points were to be attached to. The view was absolutely awesome again! Hannes needed some chocolate to calm down, then we could go on. As each of us had a walkie-talkie, we were able to coordinate everything relatively well. Our “observation team“ on the ground – Anatolij and Clemens – informed us continuously about what was going on. At 5 o'clock in the morning we were back at my place for breakfast. Half of our job had been done! So most of us slept till the afternoon, because there would be another, even harder night of the same kind. Pancakes and strawberries after getting up. Then we left the town for slacklining, which meant for most of us lying in the grass, dozing. Matthias, a sports photographer from Munich, joined us later on. We tried to take a nap after dinner before setting off. Hardly any of us managed to get more than two hours of sleep as we were all pretty nervous. Our schedule told us to wait till one o'clock. Some coffee, water and chocolate for the road and off we went. Climbing up the fixed rope was harder than we had thought, as we had fixed the rope at the side where the ladder was missing for the first 20 meters, which meant hard work with the heavy backpacks. Making the connection and fixing the whole set up took much longer than expected. Fortunately we had planned enough time for any hitches possible, realizing that working in the darkness might be more complicated. When Alex and me started to tighten the line at the side of the chimney, we heard Clemens saying on the walkie-talkie:”Hey, you guys, slow down, whenever you pull, the silo moves. Go on carefully!” Armin, who was on the other side all by himself obviously got scared a bit. So we paused briefly, but then were sure that such a huge building would be able to withstand such forces easily. A storm would have put much more pressure on the buildings. It was dawning when the line was being taped. I wasn't the only one to feel cold. The sun was about to rise. Everything went well according to plan, the line was almost finished. We had talked about everything in detail. It was only Alex who was to walk this wonderful line, as he had the best qualities to cross the line twice safely. Afterwards we wanted to derig quickly to minimize the risk of being spotted. At this height we were visible from far away and the first cars were already on the road. I kept on looking through my binoculars to watch out for any movements in the area. There was tension in the air that drove away all signs of being tired. Friends arrived by and by and could be seen parking their cars. Alex got ready – the proper clothes, helmet with a camera, leash. All cameras had been tested and were ready. 6:20 am. – sunrise – Alex is sitting on the line – go! Alex went the line onsight full man! The atmosphere was incredible – the first rays of sunshine reached us - no cloud in the sky – there was still some fog in the lower parts of our surroundings. Suffering from fatigue, everything seemed surreal to me. The sun warmed me up in no time and all tension had gone. From my walkie-talkie I heard the others cheering. I felt a feeling of success and relief spread. At the second go Alex surfed a while in front of the anchor point, then it was time to get out of the area. Our hearts were beating hard, driven by panic and stress. I repelled first; on the ground I met Armin who had just come down from the silo. We had no idea where to go and didn't know where the guard was going in his car. Neither did we get any helpful information on the radio. We only heard that Anatolij, Clemens, Hannes and Matthias had already left the area. Armin and I ran to the fence, which was closest to our cars, fully packed with gear. Suddenly the guard's van appeared behind us and came closer quickly. I was 20 meters in front of the fence, Armin 20 meters behind me. I gave it all, got out and hid. Armin and Alex were still inside the area. We stayed in contact via walkie-talkie. There were several cars on the road in the surroundings that collected us one after the other. Soon we were all outside, only Armin was missing – no reception on the walkie-talkie! It took ages until he called me on the phone to tell me that he had been caught. The boss of safety himself had come by and agreed not to call the police. He was free to go! So we got him and we felt awesome! We had coffee at the nearest coffee shop and went to my place spending the rest of the day in my garden dozing in the sun. The three weeks had been very intensive – strenuous and exhausting, pushing and energizing, risky and forbidden – they tested our limits, banded us together even more. Thanks a lot to everyone taking part and supporting us.